There is a very good chance Dustin Pedroia is going to be named the 2008 American League MVP on Tuesday. It shouldn't come as any surprise if it happens because he certainly has the credentials. (Editor's note: Pedroia was indeed named AL MVP a day after this story was originally posted.) We have the benefit of hindsight, though. How surprised would we have been if we were told he was a likely candidate back in March? True, he was the Rookie of the Year in 2007, but how often are 24-year old second basemen with 10 career home runs considered frontrunners for MVP awards? There have certainly been candidates with even lesser priors than Pedroia who have walked away with the big prize. For the most part, these are players who had never appeared on a ballot before, had not played in an All-Star Game or had not been named Rookie of the Year prior to winning the award. Remember, for the most part, our purpose is not to question these choices -- many of which coincided with the sudden rise of their teams -- but merely to point out how unlikely they were given the circumstances at the time. 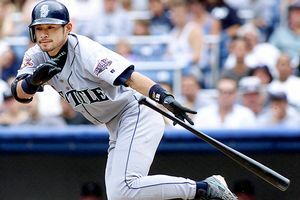 Please raise your hand if you picked Ichiro for MVP prior to the 2001 season. Just as we thought. Of all the MVPs in baseball history, Ichiro is the only one who had not accumulated any value at the big league level prior to winning the award. While Fred Lynn also won the award as a rookie, he differed from Ichiro in that he had been with the Red Sox late in the previous season and done a bit of damage. It's difficult to think in these terms eight seasons later, but Ichiro was something of a wild card when he came over from Japan prior to the 2001 season. No Japanese position player in his prime had ever played in the majors before, so entering him in the MVP sweepstakes in spring training would have been a bit of a stretch. Recall that the player to whom he was most often compared back then was Johnny Damon. At the time those comparisons were being made, Damon had never played on an All-Star team and had received exactly one 10th-place vote for MVP. When Blue began his MVP season, he had not yet turned 22, and he had appeared in just 18 major league games. As a 19-year old rookie in 1969, he had been knocked around pretty well. (He threw 298 innings as a professional that year, an eye-popping figure to modern sensibilities and one that looks culpable in his later arm miseries). After spending most of 1970 in Triple-A, he was called up late in the season and pitched two shutouts, including a no-hitter against the Twins on September 21. While Blue had certainly left a calling card, he was not on the preseason short list of MVP candidates. As September call-ups go, Lynn's 1974 big league debut was about as good as one could imagine, as he hit .419/.490/.698 in 51 plate appearances. Furthermore, he didn't play enough to end his Rookie of the Year eligibility for 1975. And that's just the thing: because no rookie had ever won the MVP award before, Lynn was not a part of the discussion heading into the season. Even with his victory and Ichiro Suzuki's award 26 years later, we rarely consider rookies as MVP candidates. One could argue that no player who was the No. 1 pick in the amateur draft should ever be considered a surprise MVP pick later on in life. Burroughs was the first player taken by the then-Washington Senators in 1969 and had appeared in 87 big league games between the ages of 19 and 21 without much success. He became a regular in 1973, hitting 30 home runs for a Rangers club that lost 105 games. While it's true Sandberg didn't come completely out of nowhere to win his award, he did come from pretty close to there. Two years before, he had finished a distant sixth in the Rookie of the Year voting, although one very prescient voter had him first. In 1982 and '83, though, his OPS+ was a good bit below league average. That is not usual launching place for an MVP candidacy. Starting in 1974, Garvey was one of the most famous players of his era. A combination of good teeth, John Edwards-quality hair, playing in Los Angeles for pretty good teams and an ability to get 200 base hits per year made him something very near a household name. Prior to '74, though, he had not qualified for the batting title, so he was not a candidate heading into the year. Nor, to be honest, should he have been by its end. Not only was Garvey not even the MVP of his team (check out Jimmy Wynn or Cy Young Award winner Mike Marshall), a case could be made that he should have finished fourth if the ballot had been limited to the Dodgers' infield -- Garvey, Ron Cey, Davey Lopes and Bill Russell. Konstanty was surprising on two counts. For one thing, relief pitchers hadn't received much attention in MVP voting to that point. Joe Page of the Yankees had finished fourth in 1947 and third in 1949, but aside from him, the highest finish for a reliever in the voting was 11th by Clint Brown of the 1939 White Sox. Through 1949, only a dozen relievers had ever even appeared in the MVP standings, and their average finish was 18th. Furthermore, Konstanty was 33 years old the season he won the award and hadn't made his big league debut until age 27 -- and probably wouldn't have gotten that break if it hadn't been for the talent depletion of World War II. After his wartime debut, he didn't get back to a regular gig until five years later, in 1949. He appeared in only 89 total games prior to his MVP season. This is not Maris' most famous season. That would come the following year when he chased and broke Babe Ruth's single-season home run record. No, this was his first year with the Yankees after three yeoman seasons in Cleveland and Kansas City. He showed a lot of improvement in 1959, though, and even made the All-Star team with the A's. As was its custom at the time, Kansas City turned around and traded him to the Yankees, where he joined Mickey Mantle in the outfield. With one of the greatest players ever sharing the same outfield, winning an MVP would not have seemed likely, but Maris did it twice -- edging the Mick by just three points in 1960 and four in 1961. Vance is probably the greatest late bloomer in major league history. He didn't earn a regular rotation slot until he was 31, which was in 1922, and yet he ended up in the Hall of Fame. He was certainly above average that year and the next, leading the majors in strikeouts both seasons and winning 36 total games, but his ERAs were not remarkably better than league average. It all came together in 1924 when he led the league in wins, ERA and strikeouts, mowing down nearly twice as many batters as the next-highest finisher. Vance was an anachronism; a power pitcher in an age when guile got more outs than whiffery. Honorable Mentions: Kevin Mitchell, 1989 NL; Mort Cooper, 1942 NL; Bobby Shantz, 1952 AL; Willie Hernandez, 1984 AL; and Zoilo Versalles, 1965 AL. Jim Baker is a regular contributor to Page 2.